The Fed sees inflation a bit differently than many in the markets do. In this note I will discuss some of the folk-economics that get talked about casually on the trading floor. I will contrast that with how Janet Yellen has recently described her view of US inflation dynamics (mainly as expressed in her very interesting speech Inflation Dynamics and Monetary Policy). If you feel like you have a good handle on how inflation works, maybe you should think again. Macroeconomists in general would not describe inflation as a well-understood problem. Economist Noah Smith, for example, says baldly that “macroeconomists don’t yet understand how inflation works.” Despite that chastening counsel, many of us have simple models of inflation that we use. For example, perhaps inflation is caused by commodity prices. Roughly, copper gets expensive so wire gets expensive so electronics get expensive so everything gets expensive. Those of us with memories of the 1970s and the high oil prices are particularly susceptible to this. And to be sure, in the 1970s inflation and commodity prices did increase together and some economists have found a statistical relationship in that blighted decade. In the more recent period, however a rise in energy prices in one year will not forecast a rise in inflation in the following year (see this paper by Kansas City Fed economists Todd Clark And Stephen Terry, for example). Since 1980, however, it is tougher to find a consistent pass-through from commodity prices to broader inflation. What we actually tend to see is prices of commodities tend to fluctuate widely, and hence CPI tends to move more than core CPI. 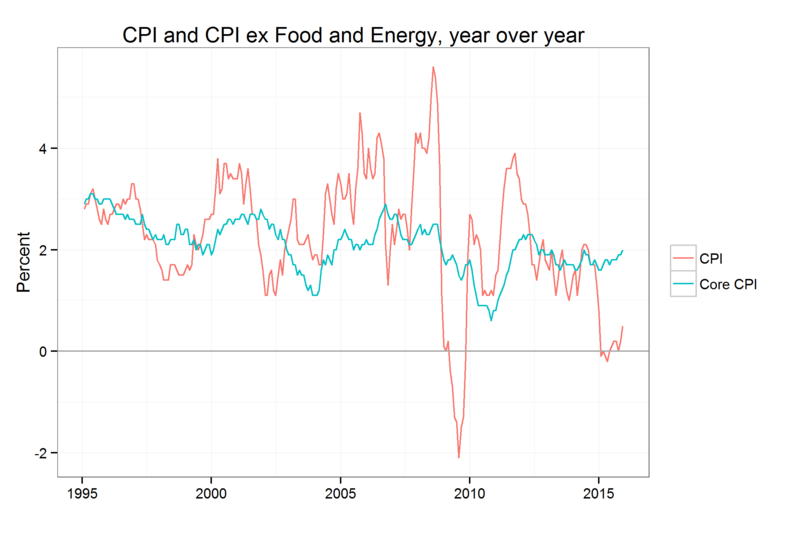 But the equation seems to be that the ex-food and energy CPI tends to be more stable than CPI including commodity prices. To be clear, of course if gas prices go up 10% today that will have an impact on today’s inflation. What is not so obvious before careful investigation is that it will have little direct impact on tomorrows inflation. Do rising wages forecast changes to inflation? Like commodity prices, this is an intuitive idea without empirical support in the United States since the 1980s. A summary of the state of research can be found in The Passthrough of Labor Costs to Price Inflation Peneva and Rudd. This research undermines the idea of a wage-cost spiral operating recently in the US, and instead suggests the preferred interpretation is high wages are an indicator of a tight labor market. What does cause inflation? The prices of inputs to production, especially imports, matter for inflation as does the level of resource utilization. But, again, this is only for the current level of inflation. What can we use to forecast tomorrow’s level of inflation? For the longer trend around which prices fluctuate, however, economists have settled mainly on the idea that one of the most important determinants of inflation is inflation expectations themselves, or more precisely, the difference between realized and expected inflation. This is called the expectations augmented Philips curve. In some sense, regressing from inflation to expected inflation does not sound like it solves much. What causes inflation expectations in their turn? The expectation of inflation expectations? Nevertheless, this seems to be the best that economist have for the time being. People make plans and contracts based on some sort of expectation of inflation and when the world does not meet their forecast the adapt in some way. The great thing about stable inflation expectations is that once you have gotten the expectations to a level you are comfortable with then prices should revert to target as people assume that moves away from the target will be reversed. The bad news is if expectations are stuck away from the desired level, small deflations tend to move back to the bad level too. The Fed feels it has built up some credibility by moving expectations to around 2%, the target which was implicit for the second half of the Greenspan years and which because explicit under Bernanke. I believe a large part of the motivation for the balance sheet expansion (QE) was to take insurance against inflation expectations becoming anchored significantly below 2%. An important question is whether inflation expectations are indeed well anchored. Presumably, businesses and consumers extract some sort of trend rate of inflation when making expectations. A long period of actual inflation away from the target will likely eventually shift inflation expectations. However, no one knows the parameters of such a function. 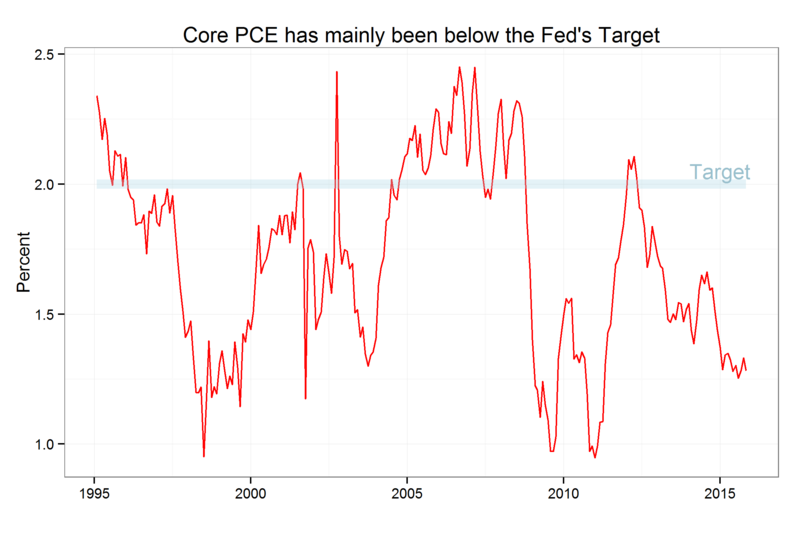 The Fed has undershot its 2% target much more than it has overshot it, and its extreme actions to move inflation back to target in the last few years have not been successful to date. The Fed believes that is because of temporary factors which should wash out over time. We shall see. The reality is that actual inflation expectations, however measured, have come down dramatically since the crisis and have not recovered. Overall, then, the Fed thinks it can solve its inflation mandate by reacting with studied earnestness to sustained tightness in resource utilization because this could lead to the extended bouts of inflation that could shift inflation expectations away from the target. At the same time they can look though inflation caused by temporary changes in market prices of currencies or commodities, as these do not forecast future levels of inflation. How does this play into the Fed’s current decision and likely course of hikes? Here is my interpretation based on closely following what FOMC members are saying: The Fed is raising rates a small amount now so it does not have to raise them a large amount later. This calculus is all based on keeping inflation expectations well anchored. The Fed feels resource utilization is tight enough that it needs to ensure the economy does not experience a protracted bout of high inflation. To that end, it seems to slow growth slightly. The alternative, in the Fed’s view, is in the medium term there will be a long period of above target inflation which will take a substantial slowdown in the economy to contain. I think it is possible to disagree with this logic. I would likely vote against a hike if I was on the board, but it does make sense. Given the tepid realized inflation figures over the last fifteen years, it also suggests to me that the Fed will not raise rates much. My guess is 25 basis points every other meeting for the next year, leaving fed funds at about 1% a year from now. Note that at that level, real rates would still be negative, and thus the Fed will still be “easing”, though at a reduced level. I expect Low and Slow to be the watchwords for the Fed in 2016. This entry was posted in John Eckstein, Chief Investment Officer and tagged commodities, Fed, FOMC, Inflation, john eckstein, yellen. Bookmark the permalink.